Galician cantor, teacher, and translator; born at Komarno; died at Amsterdam before 1709. He was the author of: "Leshon Limmudim," a guide to letter writing in Hebrew (Amsterdam, 1686); "Seliḥot," in Judæo-German, recited by the community of Frankfort-on-the-Main (ib. 1688); "Refu'ot ha-Nefesh," precepts, devotional prayers for the sick, and regulations in regard to funerals (ib. 1692). He translated into Judæo-German Manasseh b. Israel's "Miḳweh Yisra'el" (ib. 1691); Ibn Verga's "Shebeṭ Yehudah" (ib. 1700); the daily prayers (ib. 1703); the Teḥinnot (ib. 1703); the seliḥot of the Lithuanian rite (ib. 1706); "Melammed Siaḥ," Judæo-German vocabulary to the Pentateuch and the Five Scrolls (ib. 1710), and the German seliḥot (ib. 1720). 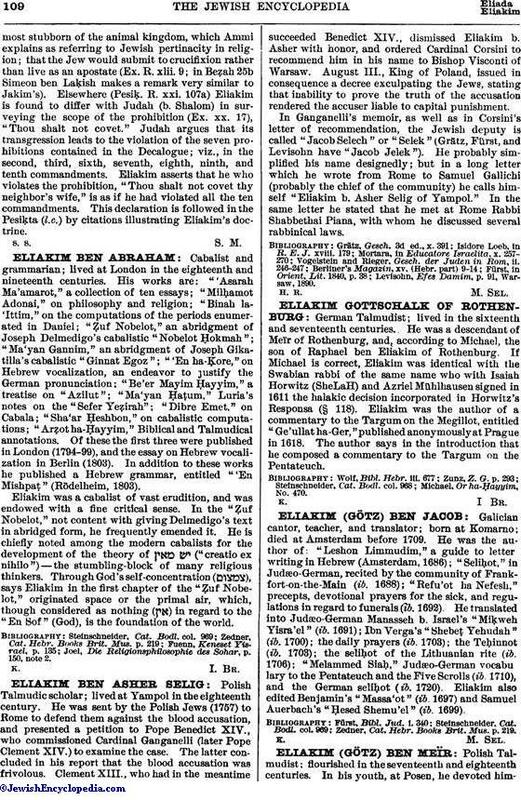 Eliakim also edited Benjamin's "Massa'ot" (ib. 1697) and Samuel Auerbach's "Ḥesed Shemu'el" (ib. 1699). Zedner, Cat. Hebr. Books Brit. Mus. p. 219.